The Maazi & Monk Bar Food Mela which has been organised by Maazi and Monk Bar, held at Hall- Leys Park, Matlock, 27th September. So if you're looking for one last summer festival then this could be the one for you! You will know how pretty the park is if you've been before, award winning and you can certainly tell. 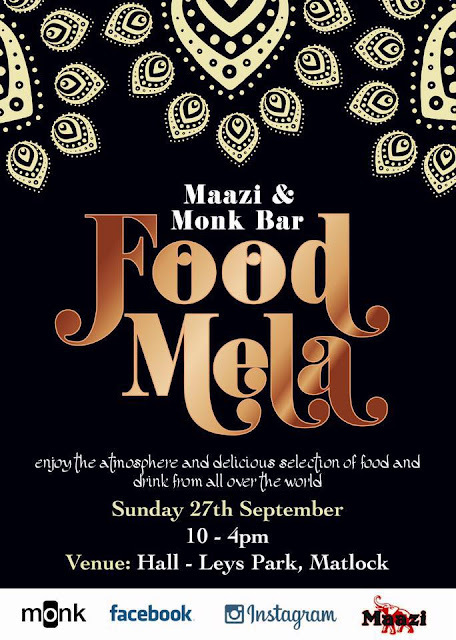 As you can see from the flyer Maazi and Monk Bar welcome everyone to enjoy the atmosphere and delicious selection of food and drink from all over the world. With Live Bhagra music and dancing throughout the afternoon and street food from Maazi along with cocktails from Monk Bar you don't want to miss out!! Hit like on the Facebook page to keep up with this exciting event HERE.